LAST VARSITY BASKETBALL GAMES AT HOME TONIGHT BEGINNING AT 6:00! TONIGHT IS SENIOR NIGHT! COME OUT AND SUPPORT THE LEE SENIORS AND VARSITY BASKETBALL TEAMS! 7:30-9:00 Lewis and DD Barksdale. Lee service project for the month of February is Clarksdale Cares. Seniors see Mrs. Antici for information about a $500 scholarship offered to area Seniors by the MSU Extension - Coahoma County office. Thursday, February 9, Rainer Powell will be here during Student Support to lead our Chapel. He will be sharing about his ministry with Royal Servants Mission Trips. We are excited about providing this opportunity for our students to learn about mission trips and the experience they provide. 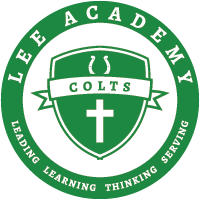 Please join us for Lee Academy’s 2017 Ag Day on February 9th at Mid-South Ag Equipment. Catfish and BBQ dinner at 6:00 with a live auction following. AWESOME AUCTION ITEMS UP FOR GRABS! The 4th annual Griffin’s Run entry forms are available in the office. Be sure to complete your form by March 10th and leave with Raychel Lunceford.